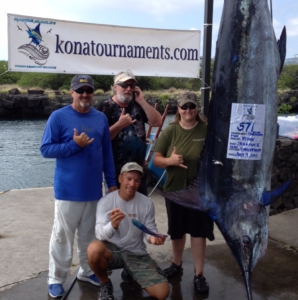 July 1st 6PM – Pupus, Registration and Team Briefing at Hawaii Big Game Fishing Club. The Single Largest Marlin of the Tournament will be Winner Take All of the purse from the Base Entry division. There are TWO Winner Take All Categories to “Throw Down”. Check back for updates on this exciting new format addition to the Hawaii Marlin Tournament Series! Early entries indicate that this tournament is going to become a Monster! Mike Kehoe spreads the word from his cell phone about his big win last summer at the 2015 Kona Throw Down tourney.